**A copy was provided to facilitate a review. Opinions are owned by Freda's Voice. Compensation may be earned from the link within. Freda's Voice is not responsible for the prize shipment, lost, damaged or stolen prizes. My all time favourite Christmas movie is National Lampoons Christmas Vacation. 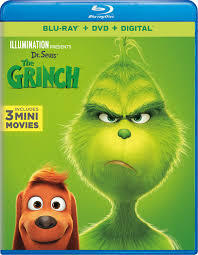 I want to win this Grinch movie because I am not emotionally ready to let go of Christmas yet. My favorite Christmas movie is It's a wonderful life. Emotional and old school. The Grinch would be for my grandsons who would love this entertainment. Home Alone is one of my favourite Christmas movies and we Love The Grinch too. I would like to win this movie to watch with my family. My favorite Christmas movie is A Christmas Story. I want to see this movie because I loved this holiday cartoon as a kid and would like to see this adaptation of it. "What is your favorite Christmas movie? What makes you want to watch this Grinch film?" My favorite Christmas movie is "A Christmas Story"! I think we'd all enjoy another witty re-telling of a Dr. Seuss classic! My favorite Christmas movie is Home Alone, Lost in New York. I want to watch this movie with my grandchildren. I love movie night with my grandchildren. I hear it's a good movie. My favourite Christmas movie is the Santa Clause, my favourite Grinch movie is the one with Jim Carey. I really want to see this new version of an old favorite! Our family has watched Elf every year at Christmas for the last several years. That's one of my favorites. My favourite Christmas movie is "Love Actually". I would love to watch the Grinch with my kids. None of us have seen it yet. Elf is my favorite Christmas movie, so funny. I want to watch The Grinch with my children because I want to see a more in-depth take on it versus the annual special on TV! Miracle on 34th St is my favorite. I want to watch The Grinch because I know my family will love it. My favorite Christmas movie is Christmas With The Kranks. I want to watch The Grinch because my family loves Dr. Seusss. I would say Home Alone.